This is a wonderful experience to share with a friend or loved one. 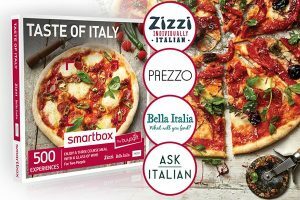 You can choose the perfect UK location for you at ASK Italian, Bella Italia, Prezzo or Zizzi. so you can treat your taste buds to a true taste of Italy. You can fill up on creamy pastas, calzones bursting with flavour and spectacular pizzas that will make your mouth water.